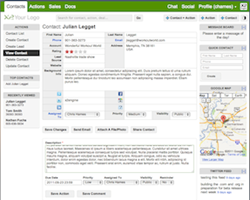 X2CRM today announced the availability of X2Contacts beta, a new open source, Social Sales Management Application. Founded in early 2011 by veteran CRM software entrepreneur John Roberts, the company has been in stealth mode designing and developing X2Contacts, a next generation open source, social sales application for small and medium sized businesses. What makes X2Contacts unique in the crowded Customer Relationship Management (CRM) field is its compact, blog-style user interface. Interactive and collaborative tools which users are already familiar with from social networking sites such as; tagging pictures, shared docs, newsfeeds, group chat, discussions boards and rich mobile and iPad apps, are combined within a compact, lightning fast, contact sales management application. Reps are able to make more sales contacts while leveraging the combined social intelligence of peers, enabling them to add more value to their customer interactions leading to higher close rates. For a live demonstration, a detailed feature list and screen shot library please visit http://www.x2crm.com. X2Contacts takes advantage of the latest open source software including Apache, PHP, MySQL and Linux (LAMP). X2Studio, an administrative tool, allows developers to create and share new application modules without any programming knowledge. Additionally X2Contacts supports HTML5, iPad, iPhone and Android mobile phones. X2Contacts is fully internationalized and has been localized into six languages with more on the way. X2Contacts can be downloaded from GitHub, Code.Google.com and SourceForge.net, and is licensed under the GPLv3. X2Engine plans to roll out commercial support and private virtual server hosting packages in October with additional details to be provided in the near future. Additionally, the company announced today the introduction of its Worldwide Partner Program, designed to support X2CRM partners across the globe. The program includes specialized developer, administration, hosting and sales management resources and training. Working with global partners is a key part of the companies’ go-to-market strategy. X2CRM of Scotts Valley, with offices in downtown Santa Cruz, California was founded in 2011 by John Roberts, a veteran Customer Relationship Management and Open Source software entrepreneur. The company provides software and hosting for X2Contacts, an open source sales management application developed by X2Engine Inc.
For more information, visit http://www.x2crm.com.